Size of Male: 30-38 lbs., 10.5-12.5 in. Size of Female: 25-34 lbs., 10.5-12.5 in. Have you seen a fat sausage-like pooch on short legs and an undocked tail? 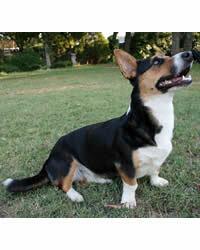 That’s how a Cardigan Welsh corgi looks! In Welsh tongue, corgi literally translates to “dwarf dog” (aptly describing the breed’s cute looks) or “gathering dog” (referring to the role of animal driving). The breed is estimated to be a yard long only. At circa 1200 B.C., the dogs traveled from central Europe all the way to Cardiganshire in South Wales, their cradle. They were useful as guardians and hunting assistants and were also quite indispensable in driving cattle. The fencing of Crown lands led to the decline of the Cardigan Welsh Corgi’s marketability. The dogs almost became extinct so that only the elite could afford to own them. The breed reached America in 1931, but it wasn’t until 1935 when this dog breed was recognized as a distinct breed apart from the more popular, dock-tailed Pembroke Welsh Corgi. This high-spirited breed is adorable to be with ? if you don’t mind its incessant barking! It enjoys daily physical exertion and feels most at home whenever you’re around. Your guests will find the pooch cordial and cute, but newcomers to your house could be in for a nasty surprise. The breed is particularly reserved with strangers and quite territorial ? if not scrappy ? with felines and other canines. Living Environment – Take your pick between the city life and the countryside. This Corgi variety adapts easily in either environment. The dogs need only enough exercise and human attention to feel at ease in any nook you call home. You may want to keep your rooms with delicate furniture off-limits as a precaution. This dog breed engages in destructive chewing when its socialization needs aren’t met. Grooming – For pet owners with little time to spend on grooming, the breed comes as one of the easy choices. The catch is you’ll need to step up to vacuuming your home daily. Use a stiffly bristled brush to de-shed the double coat of dead hairs once a week. These dogs are average and seasonal shedders. Diet & Exercise – A high-protein diet is common fare for the breed. It’s a good idea to mix this with some vegetables, fruits and cereals. Because weight gain is a common problem, go easy on spoiling your pooch. Many owners warn that these lovable dogs can develop an unhealthy dependence on small snacks. Exercise helps to tone the muscles of your hotdog-looking pooch. Moderate walks and daily sessions of vigorous play are expected – neglect these and your dog will be far from the happy and well-mannered pet you’d like to keep indoors. Nothing, of course, beats herding exercises. Health – Generally, the Cardigan Welsh Corgi is a long-lived breed, but not without the absence of a few dog health problems. These dogs are prone to gaining weight quickly and suffer the consequences commonly associated with overweight dogs. There are some recorded cases of spinal and thyroid problems. Chronic heart disease is also a major concern, and a number of tests come highly recommended: hip, DNA and eye. When it comes to dog training, the Cardigan Welsh Corgis is an eager and quick learner. In fact, mental and physical stimulation makes them happy, so let your pet indulge in regular obedience and agility classes. The pooches relish obstacle hurdling, herding and tracking exercises. If you ask expert trainers, you’ll be pleasantly surprised to be told that the breed is meant to transcend the fundamentals.